E-Book’s detractors will often decry the form as inferior to the original – and with a conventional novel, that is certainly debatable. However, they often ignore the rich multimedia possibilities offered by these new reading formats. I recently read “Live from New York: An Oral History of Saturday Night Live” and was struck by how a good book could have become a great book if it were available in digital form, with embedded video for some of the interviews and classic SNL sketches they refer to (it’s still a great read if you are interested in the history of American sketch comedy). 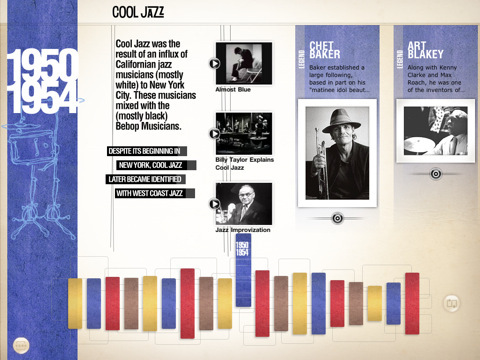 The History of Jazz, an interactive timeline, is an amazing foray into the possibilities of e-books and creates a great show case for the possibilities of the form. It’s also a handy as Jazz is amazing, but at the same time amazingly impenetrable. Don’t know your DixieLand from your Ragtime or your BeBop from your Rocksteady? I witnessed an amazing Internet argument the other day when someone dare to call a piece of Free Improvisation, “Free Jazz”, which is like confusing Mexico with Costco. Apparently. Jazz has a long and colourful history and it can be hard to a novice to know where to start or to get one’s head around it. As you might have guessed from the title: The History of Jazz: A Narrative Timeline the central organisation paradigm of a Timeline is a fantastic way to sample the rich and diverse world of Jazz. The Timeline runs along the bottom and selecting a year brings up a host of styles and notable figures of that era. Clicking a button to the side shifts the time line (in one of many snazzy animations) to reveal a series of overlapping squares to reveal the genres prevalent over the eras – with the overlap indicating the cross over between genres. Selecting an genre will present video clips from YouTube and Artist Bios from Wikipedia. This is a smart move (depending on your net connection) as it stops the app from being incredibly bloated and keeps the price relatively low. Detractors could I guess point out that the app is simply fancy packaging of publicly available material – but when you see the amount of work that has clearly been put into presentation it’s hard to begrudge them a couple of bucks, for what is an amazing primer. Throughout the app are constant links to iTunes enabling you to buy tracks of albums (they recommend certain seminal works. Which is fair enough. This is beautiful looking app with lots of eye candy and an interface slicker than Fats Waller’s Drummer/Michael Bell/Rick the Ruler (choose your own reference). You can even just leave it in a stand and have it play back some of the amazing photos the team uncovered. The videos chosen are mostly interesting and not just the artists’ biggest hits -watching Roy Ayers engaged in a vibes battle for example is wonderful. My one criticism? Some of the videos are great so it would be lovely to be able to share – either emailing a link or via Facebook/Twitter. Hopefully that will come in a future update. If you have an iPad and more than a passing interest in Jazz, this is an app for you. 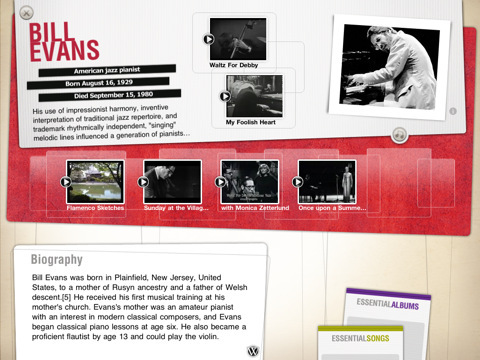 AppSafari review of The History of Jazz – an interactive timeline was written by Shem Pennant on February 11th, 2011 and categorized under App Store, Books, Featured, iPad apps, Music. Page viewed 4992 times, 2 so far today. Need help on using these apps? Please read the Help Page.